Store in a cool and dry place, keep in airtight container and use within 1 day after opening. Ingredients: Wheat Flour (93%), Water, Rapeseed Oil, Salt, Spices (Pepper, Salt, Star Anise, Cinnamon), Edible Essence, Sweetener (E951, E952, E955), Emulsifier (E471), Preservatives (E202, E262), Red Rice, Food Colouring (E153), Flavour Enhancer (E621, E635). 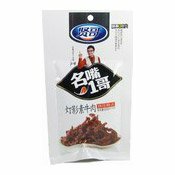 Simply enter your details below and we will send you an e-mail when “Mock Spicy Beef Vegetarian Gluten Snack (賢哥燈影素牛肉)” is back in stock!